One of the final stages of music production is mixing the audio–a process of improving the raw material and making it sound more appealing. In a Radiohead song, you might hear drums front and center, with an electric guitar in the left ear, and a subtle piano that's barely audible on the right. A well-mixed song uses creative techniques to make it easier on the ears. NCH Software's MixPad 2.07 is a super-simple mixing tool. It provides very basic controls for adjusting the volume levels and pan (left or right channel) as well as a way to apply audio effects such as distortion or chorus. With some Mac software, rudimentary features make a program easy to use and yet help you get the job done. MixPad is too stripped down—and missing some important features–to justify the $60 price tag, despite being part of a suite of NCH audio recording tools. You can conceivably use MixPad to create a good mix of your recorded song. I imported six tracks recorded with GarageBand, each as a separate MP3 file. Once imported, I adjusted the volume and pan and applied a few effects. Then, I created a final mixdown of the song. MixPad allows you to import any audio file, including a few less-common formats such as Real Audio and GSM, and includes a CD ripping option that lets you import music from CDs. MixPad does not limit the number of tracks you can mix. The interface for adjusting even hundreds of tracks is very basic—it looks like a Windows program circa 2004. Other programs, including Propellerhead Reason ( ), use a remarkably well designed and colorful interface that's welcoming and inspires creativity. MixPad, in contrast, lacks pizzazz and a Mac-friendly polish, which means using it seems like more of a chore. MixPad has a simple interface that makes it easy to learn how to mix audio clips, but the program lacks the depth required for professional mixing. This simplicity at least makes the program easy to learn. MixPad also supports drag and drop for audio clips, so you can create tracks in another program and drop them into MixPad for mixing as part of a production workflow. The bad news for audio professionals is that unlike the Windows version of the program, MixPad for Mac does not support VST plug-ins or any other audio plug-ins to extend the product. So, if you use a program such as Native Instruments Guitar Rig as a plug-in for your recording software, it will not be available from MixPad. That's a shame, because you actually can use MixPad for recording live instruments. Without plug-in support though, the program becomes a lot less useful. Plug-in support would be a nice-to-have feature in MixPad, but recording is not really the program's intended use. 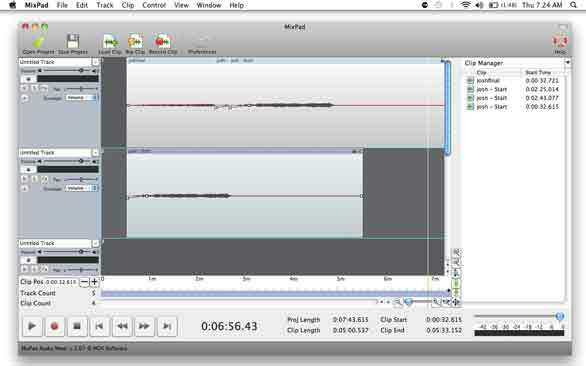 WavePad—another program in the suite intended as a recording app—does support VST plug-ins. The software provides no options for setting recording levels and viewing an obvious record volume indicator, and there’s no metronome. You can name tracks and organize them, but MixPad is still underpowered in terms of adding tags to tracks to organize them, or other visual cues. Even zooming in on a clip is strangely difficult: You can zoom vertically and horizontally using arrows and buttons, but they look dated and move too incrementally. Perhaps the most glaring problem with MixPad is that there are no options for setting EQ (improving treble, bass, and other audio issues). In professional mixing, EQ is what separates a good mix from a bad one. EQ adjustments actually change the tonal quality of the clip. Back to the Radiohead example, a well-mixed song from that band has been fine-tuned so that the bass and treble, audio frequency, effects, and subtle audio variables sound unique and pleasing to the ear. You can adjust the sound wave in MixPad (how the clip changes volume level), but not much else. MixPad 2.07 has a number of good qualities: it’s easy to learn and use, and it supports unlimited tracks and plenty of file formats. But for the price, MixPad is just not worth the investment. The interface is basic and looks dated, and it lacks important features such as EQ and VST plug-in support. For music pros or budding musicians, this program doesn’t provide enough tools on its own to make your music shine.